In an emergency, proper response is crucial in providing help as quickly as possible. Rath Area of Refuge systems help connect individuals with those who can help in a fire, medical or safety emergency. Rath Area of Refuge systems are built with a durable construction and have been installed in residential and commercial properties where a call for help could go unheard. Parking garages, stairwells, colleges, schools, office complexes and other facilities have greatly benefitted from a Rath Area of Refuge system. Our Rath call boxes provide emergency evacuation assistance with reliable two-way person to person off-site communication. With options in flush or surface mount design, these call boxes are easy to install and provide complete coverage of your facility. These call boxes come in a variety of options based on the need and are compliant with all IBC, NFPA and ADAAG code regulations. 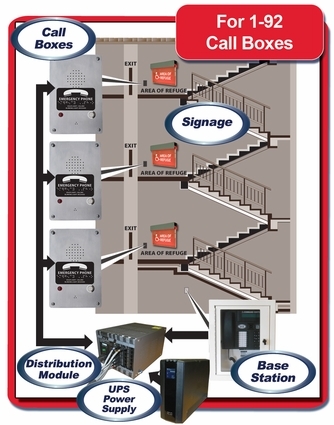 Our base station and distribution modules provide a way for coordination and control of in-building rescue in the event of emergency. With audible and visual signaling, security or other personnel are able to know where the call is coming from and be able to respond quickly. Base stations are powder coated in a steel enclosure to protect from the elements. Reliable power is key to the proper function of a Rath Area of Refuge System. Our power supply options are built with backup battery design and are surge protected. We offer signage that is compliant with all IBC and ADA governmental regulations. 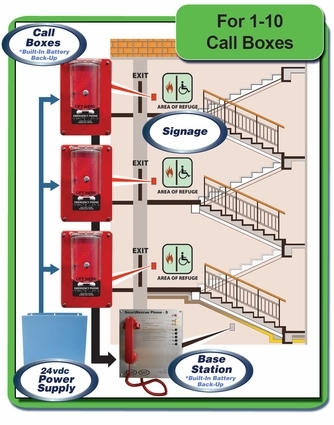 These signs are easy to read and will help identify stations and other important information. Rath Area of Refuge System cabling is reliable and dependable. Options are available for power and communication to help ensure proper connection of the system.